Learn the key business functions and understand how they operate in a global context. Spend 12 months abroad and gain practical international experience. Year 1 covers core subjects such as marketing, finance and operations. These principles will provide context for the rest of your course. During this first year, you’ll study with Management and Management with Marketing students. 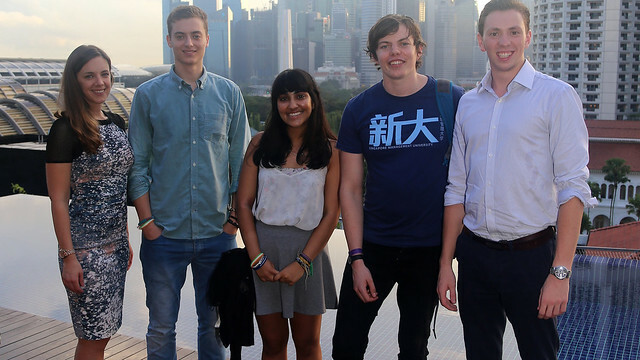 In Year 2 you’ll develop your understanding of global business. You will study advanced subjects such as international market development and finance. Optional units are available from Year 2 onwards. In Year 3 you will go abroad for up to 12 months. You’ll have the flexibility to choose a work placement, International Academic Exchange or a combination of both. In your final year you will learn about strategy and how to analyse business objectives and policies. If you want to do a placement, PDP will help you find a relevant role and make the most of your time there. In Year 3 you will go abroad for up to 12 months. You'll have the flexibility to choose a work placement, International Academic Exchange or a combination of both. We run exchanges with business schools in Asia, Europe, Australia and North and South America. Work placements are real jobs and are usually paid. You'll gain an advantage in the job market with this valuable experience. Recent employers include Deloitte, Nike and Zoku. Placement opportunities may not be guaranteed, but our dedicated Placements Team will liaise with employers, arrange interviews and help you apply. Read more about the School of Management placement scheme. Subject to approval, students can spend part of their year in the UK working in an international context. Your application is more likely to be successful if you demonstrate an active interest in understanding people, work and organisations, especially in a global setting. This should include evidence of working with others and developing transferable skills from your studies or through work experience or involvement in extra-curricular activities.